Paizo Publishing was originally partnered with Wizards of the Coast to publish two magazines; Dungeon and Dragon based on the legendary Dungeons and Dragons roll playing franchise. When these magazines were taken out of publication, Paizo adopted the open source D20 implementation of the D&D 3.5 rules and created their own RPG called Pathfinder. The Pathfinder Adventure Card Game was later developed from that franchise in order to create a shorter play card driven game with an rpg feel, some borrowed mechanics, and the ability to play single scenarios or a more extended campaign called an "adventure path". 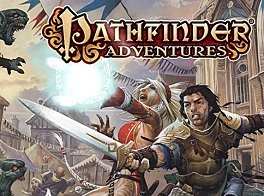 The digital version of the Pathfinder ACG has been renamed a somewhat abbreviated Pathfinder Adventures. The digital port recreates the physical version perfectly while eliminating setup time and adding story elements, extended art from the franchise, and some new cards unique to the digital game. The game is free to play and includes 2 characters and a few adventures. Gold can be earned in game to purchase more characters and adventures as well as "treasure chests" that are opened for random reward cards, similar to booster packs in a collective card game. Gold, characters, adventures as well as bundles can also be purchased with money. At launch there is a bundle for $24.99 that includes all of the current content as well as functioning as a season pass for the next few adventures to come. A typical adventure begins with the player(s) selecting characters from the selection he or she has unlocked or purchased. A party of up to six characters can be constructed in classic rpg fashion. 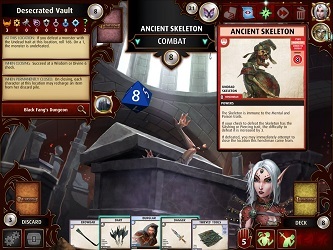 Each character is represented by a character card detailing its skills and abilities as well as a deck of cards unique to that character containing equipment, spells, and blessings. An adventure consists of a varying number of locations dependent on the size of the party. Each location is a deck of cards with enemies, equipment, spells and blessings. The player assigns members of the part to locations, and explores them working through the location's deck. The object is to close these locations by finding each one's henchman. The ultimate goal is to find and defeat the main villain of the adventure while cutting off its escape to the other locations by having them closed. This must be accomplished in a predetermined amount of time/number of turns determined by a deck that runs out as turns are taken. Pathfinder Adventures is a unique hybrid of a lcg and a deckbuilder with ccg elements. The feel of playing an rpg is well realized while keeping the affair more casual and playable in short bursts. The game is perfectly suited for an app version and Obsidian have done an outstanding job of bringing a very highly regarded game to the digital format.